Entering the third year of the ongoing collaboration of REPESEA by Erasmus + Capacity Building in Higher Education (CBHE), Universitas Gadjah Mada (UGM) represented by the Master of Science and Doctoral Program Faculty of Economics and Business (MD FEB UGM) held a series of Training in Transferable Skills. These Training in Transferable Skills activities consist of 6 series of training that use modules with various interesting topics related to improving the quality of research performance for universities that are members of this consortium. The series of training is held for a total of 6 weeks from March to June 2019 in Asian countries of the consortium members, which are Indonesia, Malaysia, and Thailand. 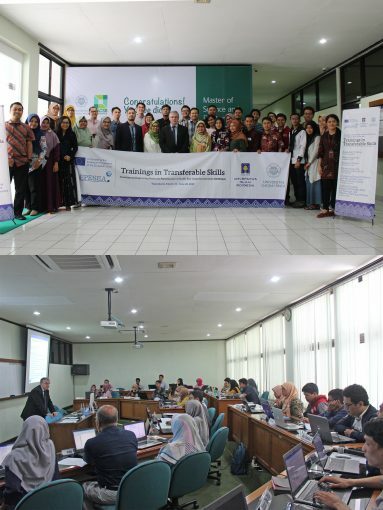 In Indonesia, UGM and Universitas Islam Indonesia (UII) are jointly hosted the series of training in transferable skills. The first training series was held at UGM on 11-15 March 2019. In this training, two trainers were delivering the presentation, they are Professor Juraj Nemec, Ph.D. and his assistant Jan Hunady, Ph.D. Both of them are lecturer from Matej Bel University, Slovakia. A total of 40 participants from UGM and UII attended the training to gain valuable knowledge and experience related to academic writing, as the theme of the delivered module is “A Guide to Successful Academic Writing”. On the first day of training, Prof. Juraj Nemec provides material related to the tips and tricks for writing articles that can be accepted in international journals. To enrich the discussion in the sessions, Prof. Jurac Nemec as the instructor asks each participant to briefly describe their research interests and what kind of difficulties that they are facing while writing their articles. The dynamics of interaction between trainees and the two trainers are increasingly felt, especially after entering the second day of the training and continued until the last day. Some participants even brought their article draft that in preparation for publication, and shared them with all training participants to be reviewed. During the training sessions, the participants not only given the opportunity to be reviewed (for the ones who bring their article draft) and review articles, but also given the exercises on how to write a concise and precise abstract and introduction. Prof. Juraj Nemec and Jan Hunady, Ph.D gave many tips for the participants, one of the tips is related to how to utilize the data that had been collected while conducting the research as effective as possible. Some of important message from Prof. Jurac Nemec is there always a possibility that researchers get a ‘treasure’ from the collected data that can be utilized further to produce high quality and publishable articles. Aside from the two trainers, the training was also attended by Prof. Dr. Noormala Dato ‘Amir Ishak from Universiti Teknologi MARA, Malaysia, which acts as a reviewer who monitors and evaluates how the first training run. After going on for 5 days, on the last day, training was closed by Nurul Indarti, Siviløkonom., Cand Merc., Ph.D., as the Director of the Doctoral Program in Management FEB UGM. Nurul Indarti expressing gratitude to all participants and speakers who had attended the training. Finally, the training ended with the symbolic ceremony of giving certificates to UGM and UII representatives, and also doing a group photo. The series of in transferable skills training will be continued with the second training which will be held on 18-22 March 2019 at UII, the theme of the second training module is “Evaluating Research Output”. UGM will return to host the third training on 25-29 March 2019, and fifth on 8-12 April 2019. Meanwhile, besides the second training, UII also will host the fourth training on April 1-5 2019, and the sixth training on 24-28 June 2019 which also as the last training of this Training in Transferable skills series.